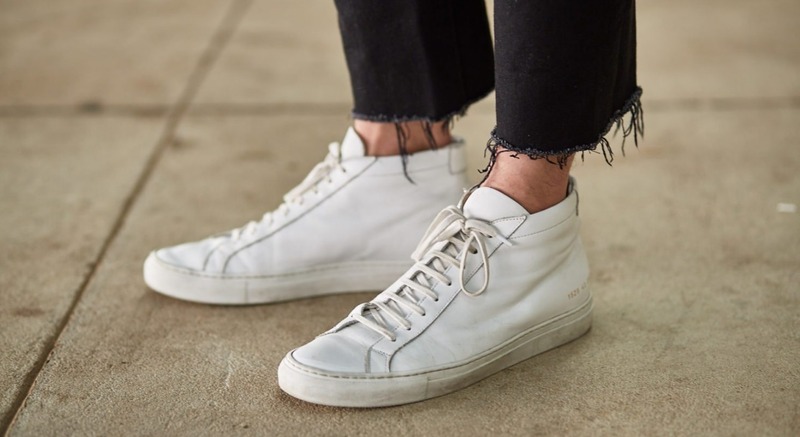 White sneakers have been a mainstay of fashion-lovers' wardrobe for many seasons now (we've certainly gone through more pairs than we'd like to admit). Despite white being one of the least practical color choices, white sneakers have stuck around. 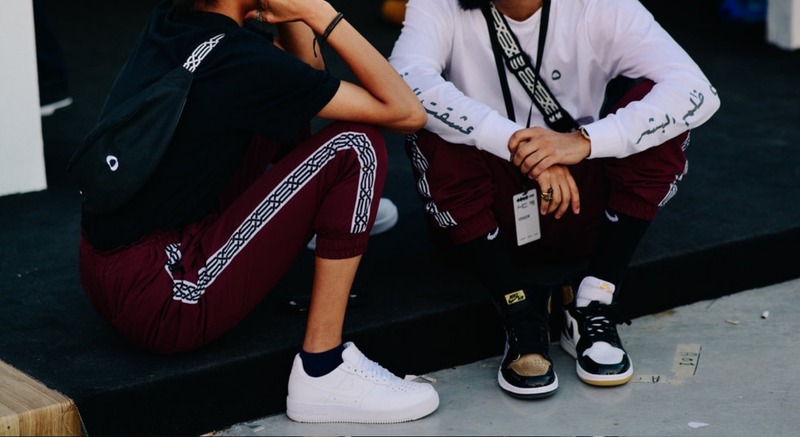 Lyst searches for white sneakers in the last year was 800% higher than searches for 'navy sneakers' and 440% higher than searches for 'pink sneakers', the two most popular sneaker colors last year. It's no secret that white low-tops look amazing with everything from midi dresses to jeans and blazers, but keeping them clean is definitely an issue (buying a new pair every time you walk through grass just isn't realistic). For anyone who's ever spilled coffee all over their brand new Stan Smiths, fret no more. White sneakers are not as impossible to clean as you might have feared. 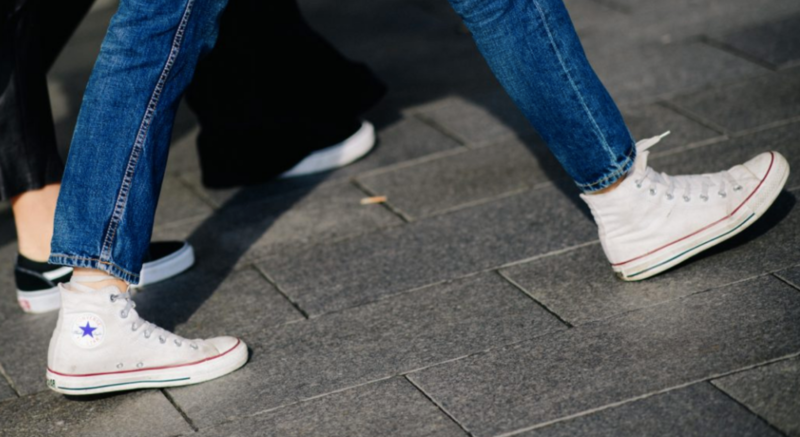 Our editors have put together a guide that answers all your spillage questions, from how to clean white leather sneakers, to how to clean white Converse? With the best cleaning and care tips split by fabric and style - once you've read this expert white sneaker guide, there's no excuse not to have your shoes box-fresh and sparkling. Classic and luxurious, leather is the no.1 choice of sneaker fabric, so it only makes sense that we know how to look after it properly. Lyst's most popular leather styles this quarter are the Fila Disruptor, Veja V 10 and the Nike Tekno. 1. Use an old toothbrush to gently scrub off any dried dirt or mud. 2. Leather shouldn't get wet, so keep a pack of wet wipes handy for cleaning off any mud or scuff marks once you're done wearing your sneakers. 3. Avoid keeping your white leather sneakers in the sun. Ideally store them in a dust bag, box or in a closet away from direct sunlight. Popular with the skater community thanks to it's lightweight feel and flexibility, canvas sneakers are the perfect summer shoe. Lyst's most popular leather styles this quarter are the PLAY Comme des Garçons high-tops, Vans checkerboard slip-ons and the Gucci Dublin skate shoes. 1. Never put in the washing machine - always hand-wash if needed. 2. If the canvas has gotten wet in the rain, stuff your sneakers with thick paper towels to help dry the fabric out as quickly as possible and avoid stains and warping. 3. Use gentle shampoo on oil stains and dab dry with a soft towel. 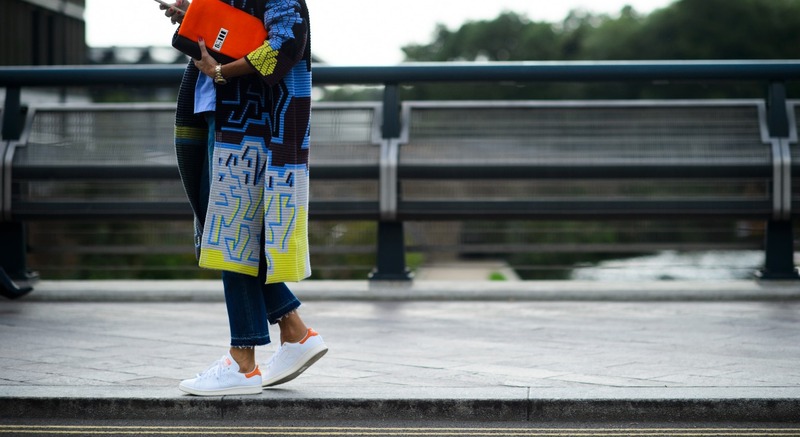 The oversized white rubber sole has crept into sneaker trends this year making it a perfect time to invest in a pair. Lyst's most popular leather styles this quarter are the Alexander McQueen Extended Sole, Vans Old Skool and the Nike Air Max 95. 1. Soak your white soles in a shallow pan to lift off any excess mud and dirt. 2. Use diluted bleach to clean any hard-to-shift scuffs. 3. Use white nail polish to cover dark scratches. Mesh has become more and more popular in sneaker designs thanks to this season's futuristic trends. Lyst's most popular leather styles this quarter are the Valentino Sock sneakers, APL Athletic Propulsion Labs Phantom and the Adidas nmd. 1. Use a toothbrush, gentle soap and water to remove any discoloration on the mesh. 2. Invest in a magic eraser to keep tonal shades of white bright around the mesh. 3. Always dry mesh with a soft cloth once finished cleaning to avoid water stains. 1. Put your laces into a small laundry bag and add to your regular wash.
2. Don't tumble dry - let laces air dry on a sink or rail to avoid shrinkage. 3. Use diluted bleach and a cotton bud to get rid of darker stains. If you see a little scratch or smudge on your box-fresh white sneakers, just take out your favorite white nail polish and do a little touch-up - simple. For oily stains, get out your gentlest shampoo, some warm water, and use a toothbrush or rag to gently wipe at the smudge. It should come right out. Don't leave your white sneakers outside. They're already getting enough UV exposure as it is, which can lead to fading and unwanted discolouration. Treat them well, and store them in a cool, dark place when they're not being worn. To help damp shoes dry faster stuff them with crumpled-up paper towels which will absorb any excess moisture. For scuffs on any suede patches, don’t use water, which has the potential to permanently damage the material, instead, try using a nail file. Take a plain, uncolored file to rub out the stains while maintaining the natural grain of the suede.